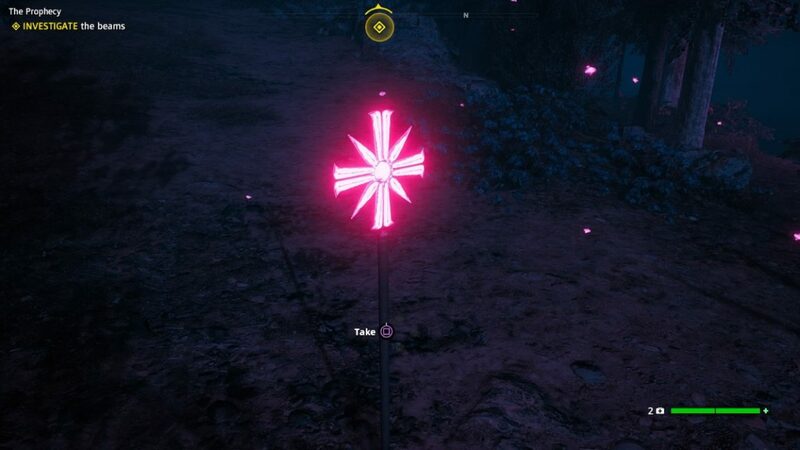 This guide contains spoilers for Far Cry: New Dawn, but if you’ve arrived here by searching, we’re guessing you need a little help with an annoying puzzle. 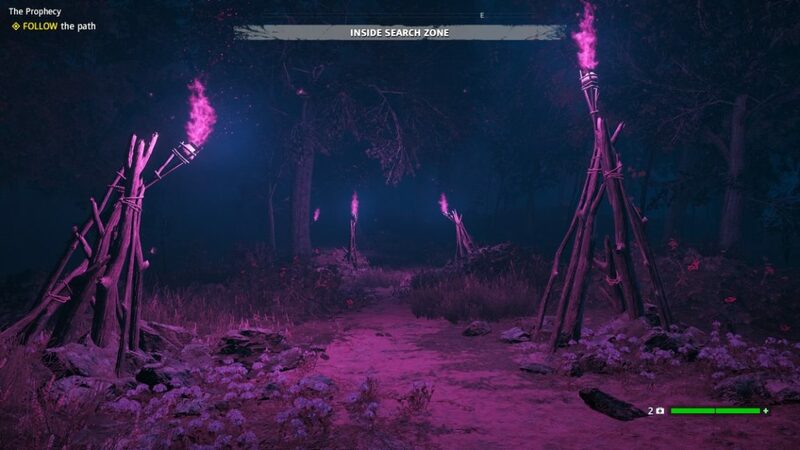 As part of the main story campaign of Far Cry New Dawn, you will have to go to Eden’s Gate to get help from what’s left of Joseph Seed’s cult, the original bad guys from Far Cry 5. As you arrive for the first time, you’ll be turned away by the guards and instead told to go to a nearby island – you’ll see it marked on the map. There’s a boat at the bridge that you can use. Once at the island you’ll be prompted to investigate the beams, so go to the closest marker, which is by the waterfront. 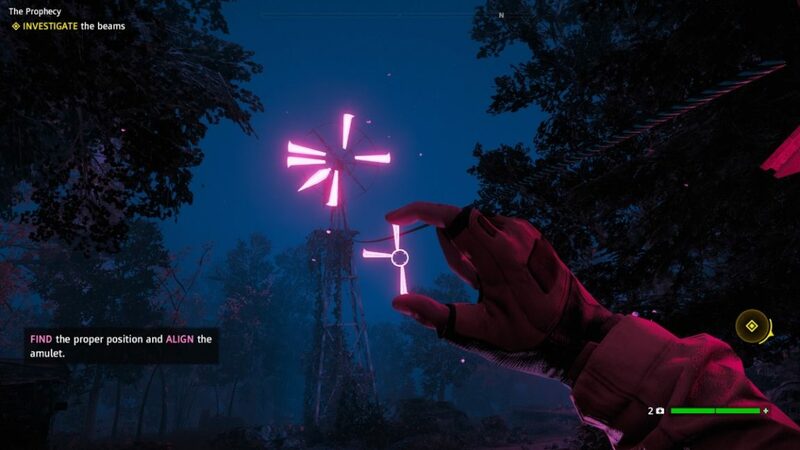 You’ll see a vision in pink of Joseph Seed standing next to an Eden’s Gate cross. When you interact with the cross, you’ll be given a small piece of the Eden’s Gate amulet, which you can hold up by holding up on your d-pad. This puzzle requires you to align the piece of the amulet with larger pink Eden’s Crosses on the island. You’ll have to do this three times in three different locations. It’s a little visual illusion and is fairly simple once you know how. Listen to Joseph Seed on each occasion and he’ll give you audio clues too. If you turn around from your current location you’ll see the first big pink cross but it’s partially obscured by pink vines. Joseph is talking about “burning your sins”, and there just happens to be some Molotov cocktails here. Throw one at the vines to burn them off, then stand on the jetty with the pink marker and crates. You’ll be able to align your small piece of the amulet with the larger cross, and the perspective will make it look like the full and complete cross. Both will disappear, signifying you’re completed the first part of the puzzle. You’re now going to repeat this process for the other two puzzles. 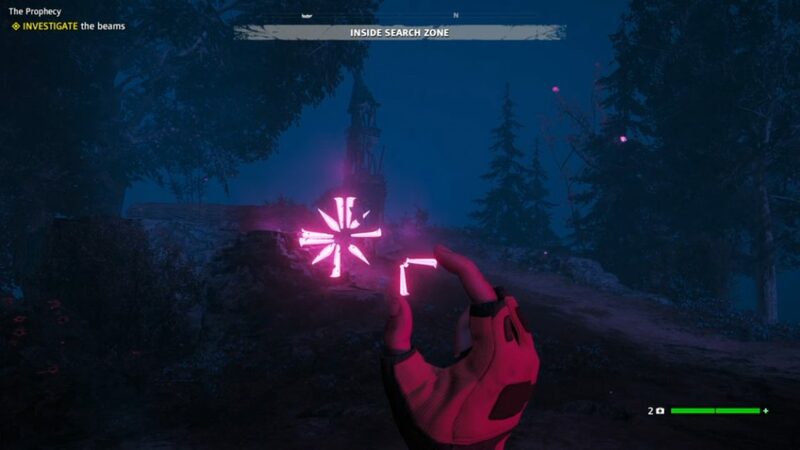 Next, head to the cabin inland and interact with the cross again to get the smaller amulet. You’ll see Joseph again, and he’s talking about “the winds of change”. Here you’ll see a windmill with part of the Eden’s Gate cross on it, and hanging from the cabin porch is a handle that you can pull to rotate the windmill sails, and the Eden’s Gate cross along with it. Hold up the small amulet and use the pulley hanging on the porch to rotate the glowing cross so it roughly aligns with the piece you’re holding. It doesn’t look like the right fit from here, so you need to go inside the cabin where the pink prompt is, and stand behind the bar to line it up through the hole in the roof. The cross will disappear and you’re done. Now go to the final beam which is on a smaller island close by. Grab the staff, which again hands you the smaller Eden’s Gate amulet. Joseph talks about how his family was “smashed and broken”, which is your clue. The pieces of the larger pink cross all lay on the floor, propped up against rocks but also partially obscured by wood. Kick and smash all the wood. Stand at the bottom of the hill here, hold up your symbol and align the cross and you’re all done. 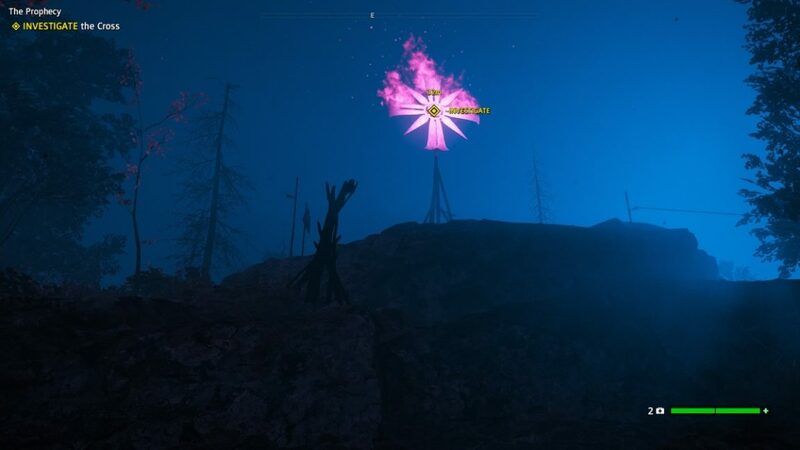 You now go to the big cross at the top of the island and follow the path illuminated by the pink flames, before entering the bunker. The end of this mission hands you the book, The Word of Joseph which you take to Ethan Seed to continue the main story campaign. 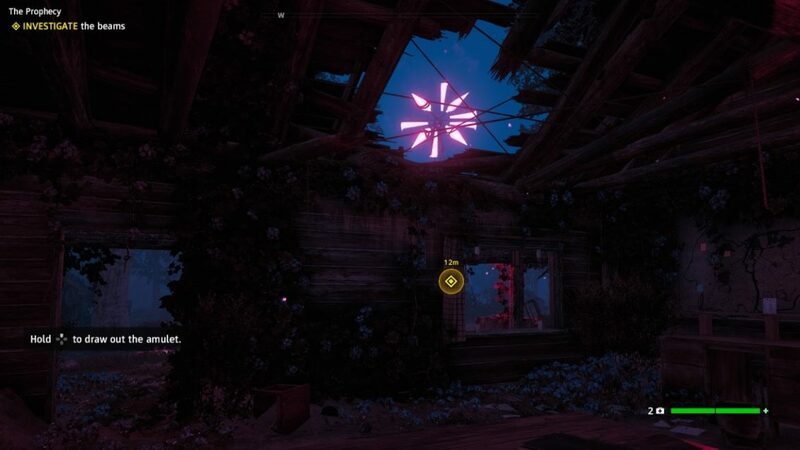 Now that’s sorted, you can find more Far Cry New Dawn tips here, as well how to get the best gun in Far Cry New Dawn early.